New PhD Program in Septuagint Studies (McMaster Divinity College) | Septuaginta &c.
Thankfully, the situation is about to change for the better. McMaster Divinity College, located in Hamilton, ON, has announced the launch of a new doctoral program focused specifically upon Septuagint studies. In case you are unaware, McMaster is an excellent institution that is quickly becoming known for churning out well-trained and rigorous PhDs, particularly in biblical studies. Home of respected scholars like Stanley Porter, Cynthia Long Westfall, and Mark Boda, “MDC” is an excellent option for graduate and postgraduate study. I was able to obtain some of the details for this program. First of all, this program will be considered an area in the Biblical Studies concentration of the PhD in Christian Theology. The Septuagint Studies program offers a track in the Biblical Studies division of the PhD in Christian Theology (besides Old Testament or New Testament). The Septuagint Studies option allows for specialization in a distinct area of biblical studies that combines elements of the other two tracks, and provides a program without parallel at the doctoral level in North American institutions. The size of the doctoral faculty in Septuagint would be larger than at any other institution in North America, so far as can be determined. The program will include reference to both the major approaches to the Septuagint, the Greek-text oriented/literary approach and the interlinear approach; there are representatives of each position on the faculty. Six of the faculty are involved in writing Septuagint commentaries reflecting the two positions, as well as authoring other works in Septuagint studies. The Septuagint Studies program may be approached from either Greek or Hebrew, and the student will have a primary supervisor in the dominant language and a secondary supervisor in the other. The student’s supervisory committee will consist of a minimum of one faculty member from each of the language areas (Greek and Hebrew). The broad contours of the program are given below. The program of study is four years (with a maximum of six years). The admission requirements are the same for Biblical Studies (Old or New Testament) with one change in the language requirements. Two years of study in each of the biblical languages, regardless of whether specializing in Greek or Hebrew, are required. The student takes the following selection of courses, with modifications as necessary on the basis of course offerings and specialist needs. Why a PhD Program Dedicated to Septuagint? 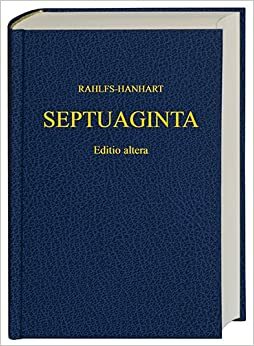 In case you’re lost as to what the “two major approaches to commenting on the Septuagint” are, I recommend reading through my multi-part series on the major modern translations of the Septuagint (Intro, Part I, Part IIa, Part IIb, Part III, Part IV). If you are interested in finding out more about this new program, I recommend visiting the McMaster website to check out the school, and browsing through the webpages of the various faculty members mentioned above. You can then get in touch with them more directly by email. Reblogged this on συνεσταύρωμαι: living the crucified life. Pingback: North American Graduate Programs in Septuagint | Septuaginta &c.
Well done, MDC! May your numbers increase. Pingback: 2018 TWU Septuagint Summer Course: LXX-Job | Septuaginta &c.